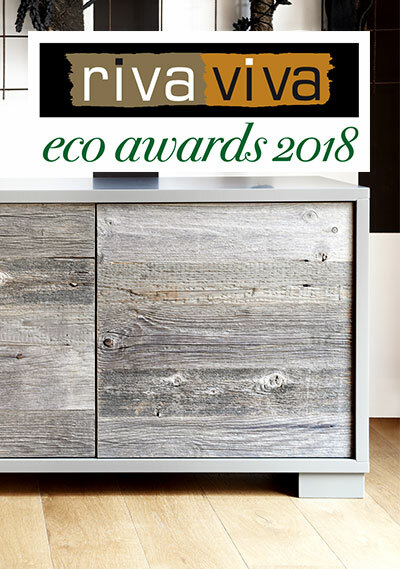 Design, health and sustainability are part of the challenge at Design Week in Milan, as Riva Arredamenti launches the First “RivaViva Eco Awards”, and the winners will be the best eco-friendly furnishings. At Spazio RivaViva in the Isola district, in addition to the exclusive woodworking production of this historic Brianza brand, you will also find furnishings created by the stars of the Sarajevo School – represented by companies Artisan companies and Gazzda, whose designers include international renowned names such as Salih Teskeredzic and Mustafa Cohadizic – who have reclaimed the distinctive woodworking and wood-engraving skills of their local traditions, and whom only RivaViva exclusively represents in all of Italy. The key concept of the event is a “zero-impact” life that does not have to forgo beauty. It is a choice that is in favour not only of the environment, but also of the health of those who spend time enjoying their home and their furnishings. Design becomes the fruit of an effective concept of materials (ones that do not contain harmful substances such as solvents, petroleum derivatives, formaldehyde and other toxic agents) and intelligence in design. Design, in other words, that is “healthy, beautiful and sustainable”.